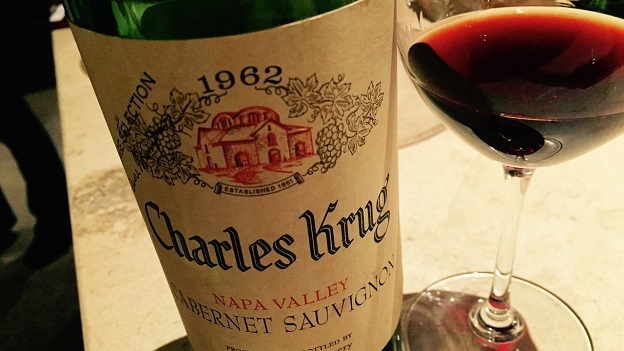 Charles Krug’s 1962 Cabernet Sauvignon Vintage Selection opens the window into a much earlier era in the history of Napa Valley, when things were quite a bit simpler than they are today. The 1962 was made by brothers Robert and Peter Mondavi. Based on what I have been able to piece together from various sources, the 1962 was 100% Cabernet Sauvignon, most likely from old, heavily virused vines picked in late October or early November. It was a very rainy year, with 45 inches of total rain, 12 of which fell in October. The finished alcohol was around 11.4%. At the time, the Charles Krug Cabernets were fermented in redwood uprights and aged in used whiskey barrels. As it turns out, 1962 holds considerable significance for the Mondavi family. That year Robert Mondavi travelled to France for the first time and was exposed to the concepts he would use to found the Robert Mondavi Winery a few years later and in time change the course of Napa Valley. Upon first opening, the 1962 Cabernet Sauvignon Vintage Selection is quite closed, but then with a bit of time in the decanter, the aromas start to freshen up and the wine becomes more lifted. Cinnamon, crushed flowers and sweet red cherries find support in silky, exceptionally polished tannins. The 1962 is ethereal and delicate, yet it has managed to retain quite a bit of freshness through to this last phase of its life. Today, the 1962 is fully mature. Well-stored bottles are still alive, but there is no upside to be gained from further cellaring. What a treat it is to taste the 1962 Cabernet Sauvignon Vintage Selection, a wine that reminds us of just how well Napa Valley Cabernets can age. 92/Drink now.